This is a draft of a story I wrote for my three-year old daughter, Poppy, because she keeps asking me to tell her more about Socrates. Hundreds and hundreds of years ago, almost two and a half thousand years ago, a very wise man lived in the city of Athens. His name was Socrates and some people say he was the wisest man who ever lived. He said he was just a “philosopher”, though, which means someone who loves wisdom but isn’t wise yet himself. So philosophers are always looking for wisdom. Socrates’ daddy was a stonemason and sculptor called Sophroniscus, who helped to build a famous temple called the Parthenon, high up on a hill in Athens, in a place called the Acropolis. A stonemason is a man who cuts stone and a sculptor is a man who makes beautiful statues. When he was young, Socrates learned how to cut stone and make statues, just like his daddy. That’s what he did for a living and he became very good at it. Some people say he made a famous sculpture, a statue, of three beautiful goddesses called The Three Graces, which stood at the entrance to the Acropolis. 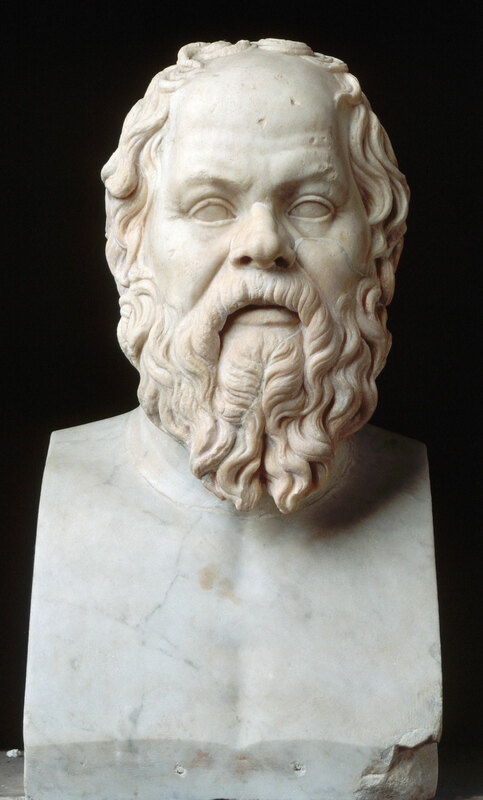 Socrates tried very hard to make statues that were perfect. He wanted to show everyone what a totally wise and good person might look like. He believed that wisdom and goodness were beautiful but he wasn’t really happy with the statues he created. He felt something was missing. So he spoke to the other stonemasons because he wanted to learn from them but he found that although they made statues of people who were good, they couldn’t really explain to him what goodness was or how to learn about it. He said they had become like blocks of stone themselves because they lacked wisdom. They were looking outside at the statues too much rather than looking inside themselves. Then Socrates had an idea. He put down his tools and from that day forward he stopped making statues. He said he was amazed that the sculptors who tried so hard to make blocks of stone into statues of perfectly wise and good people didn’t know how to become wise or good people themselves. So he decided to stop sculpting stone and to begin sculpting himself, his own mind, his character, and to become wise and good. He was going to make himself beautiful rather than making beautiful statues. Everyone thought this was funny because Socrates was not very beautiful to look at. He had a big round belly and a snub-nose and his friend Plato said he looked like a satyr, which is a cross between a man and a goat! Socrates laughed back at them, though, and said that true beauty comes from within, from our character. He liked to joke that if there was a beauty contest between him and the people laughing at him then he would be the winner because he was more beautiful inside. So he gave up being a stonemason and a sculptor and instead of doing his daddy’s job he decided to switch to doing his mummy’s job instead. Socrates’ mummy was a midwife. When a lady has a baby inside her tummy, a midwife is another lady who helps her give birth, so the baby can come out of her tummy and ride around in its pram. Socrates said he had become a midwife just like his mummy but he didn’t help ladies with babies in their tummies to give birth to them… He helped people, men and women, with ideas inside them to give birth to those ideas, so they could share them with other people, talk about them, and try to learn the truth about them. Socrates helped people to give birth to ideas by asking them lots of really difficult questions about what it means to be wise and good. He asked soldiers “What does it really mean to be brave?”, he asked leaders and politicians “What is justice?”, and he asked teachers “What is wisdom?” Socrates said that if you can learn what it means to be a good person you’ll become wise and live a good life. He always pretended he didn’t know the answers. Some people say, though, that by patiently asking lots of difficult questions, helping other people to give birth to ideas, and listening carefully to what they said, Socrates became wise himself and he lived a good life. People still remember him today, even though he died a very long time ago. Today architects and stonemasons are trying to restore some of the damage the 2500 years have done to the Parthenon. They are finding it difficult to reproduce the fineness of the work. That fineness is testament to the wholeheartedness that the masons of Ancient Athens gave to their work. This makes me think that those masons were well on the road to real wisdom, whatever Socrates thought. I enjoyed it. Be good to your daughter and write more like this!